On June 13, 2018 Mr. Jim Bohnet of Mayerthorpe, AB passed away at the age of 78 years. Jim is survived by his children, Clint (Erica Swan) of Moncton, NB, Ross (Lana) of Mayerthorpe, AB, Warren (Lana) of High River, AB, Wanda (Ian Clifton) of Lethbridge, AB, and Mark (Roxanne) of Edmonton, AB; brother, George (Rose) of Milk River, AB; eleven grandchildren, Ashley, Cody, Kyle, Denny, Lacey, Tera-Lynn, Derek, Tyler, Shaenna, Jesse and Madison; and ten great-grandchildren. Predeceased by parents, Bill and Clara; and sister, Irene (Edwin) Stock. 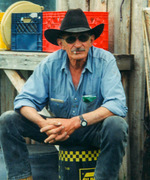 Jim grew up in southern Alberta and was always involved in ranching. He was a truck driver for many years, a jack of all trades and never afraid to tackle any job. Jim loved his horses and his family, and always had a great story to tell. The family would like to thank the staff of Mayerthorpe Extendicare for the care they gave Jim over the past three years.